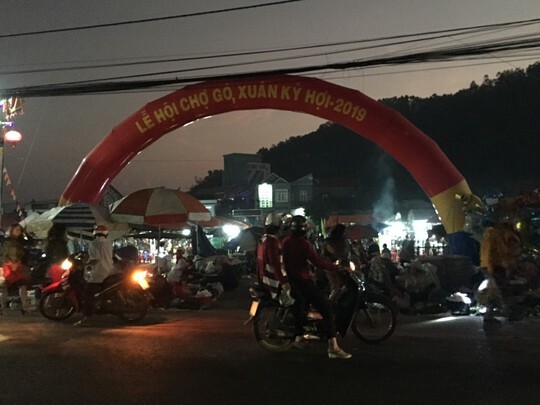 Go Market in Tuy Phuoc Town, Binh Dinh Province only opens on the first day of the Lunar New Year, attracting many tourists. At 5 am on February 5, the first day of the Lunar New Year, thousands of people flocked to Go Market at the crack of dawn. There was no luxury or unique items at Go Market, just everyday goods made by the locals. Customers go to the market to enjoy the atmosphere and buy betel and areca, fruits and fish as they believe they bring them luck. Customers and sellers didn’t bargain like in other markets. “My family goes to Go Market every year to buy betel and salt for luck. I paid whatever the seller said,” said Thai Thi Hoa from Quy Nhon City. Visitors had the chance to enjoy various local dishes there and participate in the traditional games and dances. One of the highlights of the market was the exchanges of traditional martial arts performances. No one remembers how the market was formed. It is said that the market has been held for hundreds of years since the Tay Son Dynasty. In 2011, Go Market was named among top 100 unique markets in Vietnam by Vietnam Book of Records.